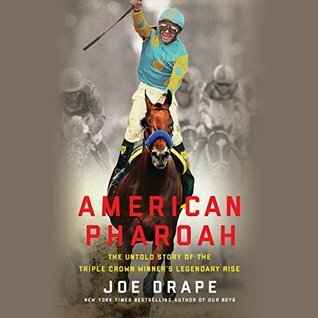 In 2015, American Pharoah became the twelfth horse to win American thoroughbred racing's Triple Crown, the first to do so since Affirmed in 1978. This is the story of his racing career, his breeding and training, and the owner/breeder, trainers, jockeys, and competitors that were apart of his journey to that accomplishment. Horse racing can be a questionable sport with a lot of questionable people. Joe Drape doesn't focus on that more than he needs to, but also doesn't ignore it. A horse can't ask for a second opinion on whether the stuff his trainer wants him to take to help him perform better is either safe or legal. But the horses are beautiful, and as long as there are no accidents on the track, it's a joy to watch them run. There are a lot of colorful characters in racing, too, and the people around American Pharoah (I should mention that yes, that is the correct spelling of his name) are no exception. Breeder/owner Ahmed Zayat is Egyptian, an Orthodox Jew, and made his money selling beer in mostly Muslim countries. Trainer Bob Baffert is a Hall of Fame trainer, with a long history in the sport, loud, often arrogant, and intense. Jockeys Martin Garcia and Victor Espinoza rode him and played roles in his training, and have their own interesting life stories. This is an enjoyable and interesting book, though it helps to have an interest in the geeky details of horse racing.